With Christmas season in full swing and the big day drawing ever nearer, we thought we would share some great gift ideas and also let you know about our last Delivery Dates. Stuck for what to buy? Our speciality hampers are filled with some of our most popular products to suit just about everyone on your Christmas list. From the ‘Keen Gardener’ to the Young Naturalist, we have got a selection of products at brilliant ‘package’ prices ready to be wrapped up as Christmas gifts. Launched just a few weeks ago, we are delighted to be able to offer Gift Vouchers this Christmas. With the option of having either an ecard or a voucher posted directly to the recipient, it couldn’t be easier to give a wonderful gift. The Siberian Winds have already brought snow to some of the UK this week, be prepared by ordering your Snow Shovel, Grit Bin or Sledge this weekend for despatch on Monday. Did you know……you can order a wormery with a ‘Worm Voucher’ so the live worms can be requested by the recipient after Christmas! 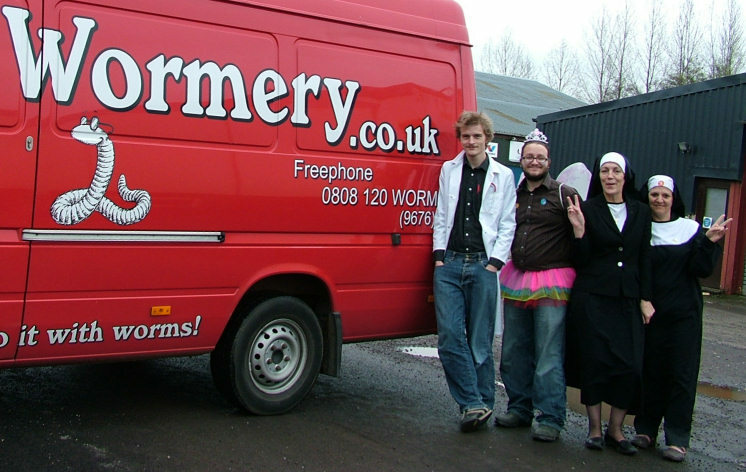 This means you can get a wormery delivered in good time for Christmas and the worms won’t be affected! Kitchen waste composting with attitude and style! For years composting was the domain of those with space and large gardens. Then came Wormeries and Bokashi composters which opened up this vital and interesting area of recycling to many more of us. Now we can cater for just about anyone who generates kitchen waste, no matter how small their house or flat, with the new Urban Composter. For all those last minute shoppers out there, the last order dates for delivery before Christmas are below….watch the weather forecast though and order early if bad weather is predicted! Open week days 9am – 5pm until Friday 21st December. Closed for Christmas Annual Holidays: 22nd December till Monday 1st January 2013. Open again for Business Tuesday 2nd January 2013. Follow us on Facebook and Twitter and WIN! It’s good fun this ‘getting social’ at work. Spending half my day on Facebook / Twitter / Blogs etc.. actually becomes totally legitimate :-). For a little while now we’ve had a Facebook ‘page’, though we’ve not really done a lot with it until recently! However, a couple of weeks ago, we thought it would be worth jumping on the bandwagon and so we’ve joined the Twitter revolution too. There’s so much going on out there. And as well as contributions from the team here, we’ll also be posting regular contributions from outside experts and contributors. We don’t influence these external contributions at all – we just provide the platform for the content and hopefully it will give readers something far more interesting to look at when they come here. If you’re interested in contributing – do get in touch! We’ll be pushing updates from the Blog out through our facebook page and twitter feeds as well as right here. You can WIN with Original Organics! To celebrate all this, we have £100 to spend with Original Organics to give away… and we’ll be picking a follower at random on both Facebook and Twitter to win £50 each on January 4th 2010. All you need to do is ‘follow’ us on Twitter or ‘Become a fan’ of us on Facebook to be in with a chance of winning. We will put all the names in a hat (or maybe we’ll need a large ‘sack’) and picking one from each site out at random. Follow Original Organics Ltd. today! Welcome to Original Organics – I mean literally! We’ve just rolled out a brand new page to the About Us area of our website. Webcams! Yes, that’s right, now you can spy on us while we’re hard at work here at Original Organics. We do like to feel that our customers and us are one big happy family (cheesy I know!) and we strive to be plain and transparent about everything we do – so please excuse the mess! The cameras cover our main office, part of our production and despatch area and our “mission control” office which is where Paul L and I work hard all day to make sure our website and our service is the best out there. So, come on in and take a look around.